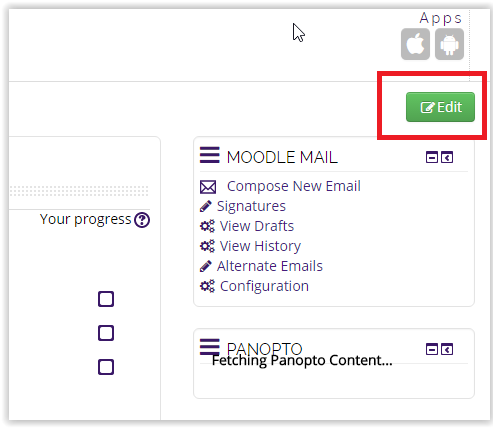 To allow students to submit a file through Turnitin, an instructor must first create a Turnitin assignment within a Moodle course. 2. Click the Edit button in top right corner. 3. Select the Add an activity or resource link, found under any Topic or Week at the bottom right. 4. 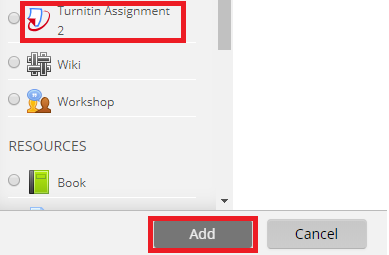 Select Turnitin Assignment 2 from the left side of the Add an activity or resource window, then click Add at the bottom. 5. Under the General heading, enter the Name of the assignment, select the Submission type, and Name the first section (part) of the assignment. It is recommended that you select the File Upload option for Submission type. NOTE: These are the only three fields that are required for the assignment to be created. However, Allow submission of any file type is of particular importance. This option controls the file types that students are allowed to upload by dividing them into two categories: those which can be checked for originality and those that cannot. Choose No in the dropdown to limit student uploads to only those file types that contain highlightable text and are therefore able to generate source matches in the originality report. Choose Yes to allow students to upload additional types of files such as images that cannot be compared to other sources. 6. Under the Grade category, you can update the Type, Scale, Maximum Grade, Grade Category, or Grade to Pass. If the Grade type is set to none, a graded item will not be created in the Moodle course gradebook. NOTE: To set a Maximum Grade for your assignment, you must enter it under the Grade heading, as well as in each assignment part area. If the maximum grades needs to be changed at a later time, it will need to be changed in both places. 7. Under Assignment Part 1 and any subsequent parts, enter a Name and select the Start Date, Due Date, and Post Date for each part. Important: The Post Date is when students will be able to see the grade you assign and any comments/ feedback you give in the Grade Mark view in Turnitin. Students will not see comments you have made until this date has passed. However, this field does NOT control students viewing their grades in the Moodle gradebook after you save them. This setting must be changed in Gradebook setup. 8. Under the Originality Report Options heading, adjust the assignment to your preference. Be sure to pay attention to the settings for both Report Generation Speed and Store Student Papers. 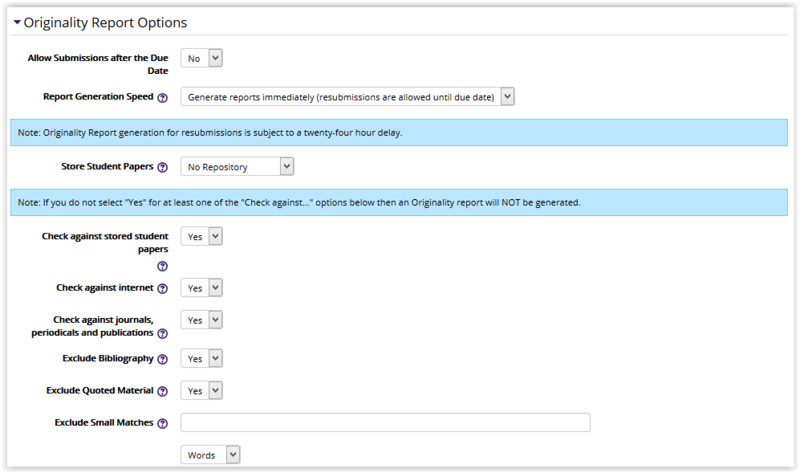 The Report Generation Speed allows you to indicate when students see the similarity report and if they are allowed to resubmit their assignment. There are three options; instructors can choose whether or not to allow students to resubmit papers before the due date has passed and when to generate an originality report. With the first two options, Instructors can choose whether to generate a report immediately or on the due date and choose, if reports are generated immediately, whether or not to allow student resubmissions. The third option, if selected, will cause all student submission originality reports to generate on the due date. Resubmissions are allowed if this option is chosen. 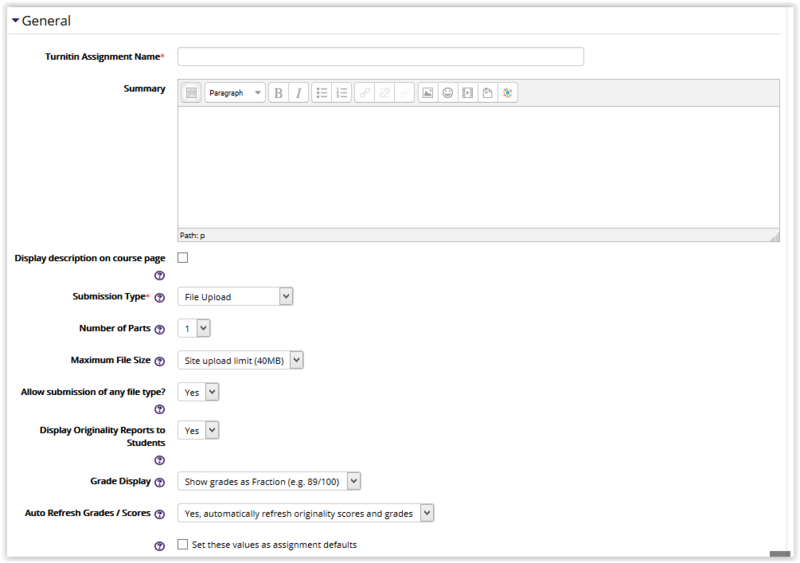 The Store Student Papers setting allows you to select whether or not you would like students' assignments to be stored within the Turnitin database. Dropdown choices include no repository or standard repository. If papers are added to the standard repository, the student username associated with that paper will not be associated with the paper. Instead, the image of the paper is tagged with an ID number and then the paper can be used in comparisons for future assignments- either yours, others at your own institution, or at other schools that use Turnitin. NOTE: For Rough Draft assignments that will have a final draft, consider not storing the Rough Draft in the Standard Repository. NOTE: When working in a Development or Test environment, do not store papers in the repository. 9. You can also modify the settings underneath the GradeMark Options, Common module settings, Restrict access, Activity Completion, and Tags sections. These sections do NOT have to be modified for the assignment to be created. (Using the "Restrict access" setting is NOT the same as setting a due date). 10. Click Save and return to course OR Save and display from the floating grey box at the bottom. a. If you choose Save and return to course, you will be brought back to your My home Moodle page. b. If you choose Save and display, you will be brought to your assignment. 11. You can change any of the dates selected in this view. The Grades Available is the maximum grade for the assignment. 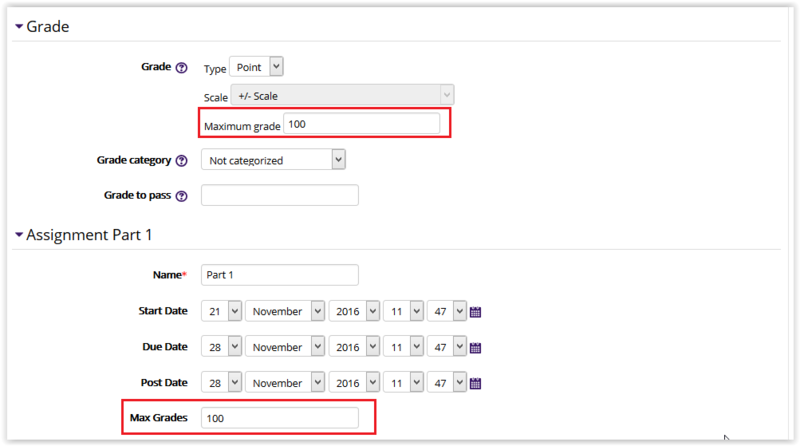 When creating a Turnitin assignment, a grade item will automatically be created in the Gradebook. Be sure to go into the gradebook to ensure it is weighted properly and in the correct category if applicable. 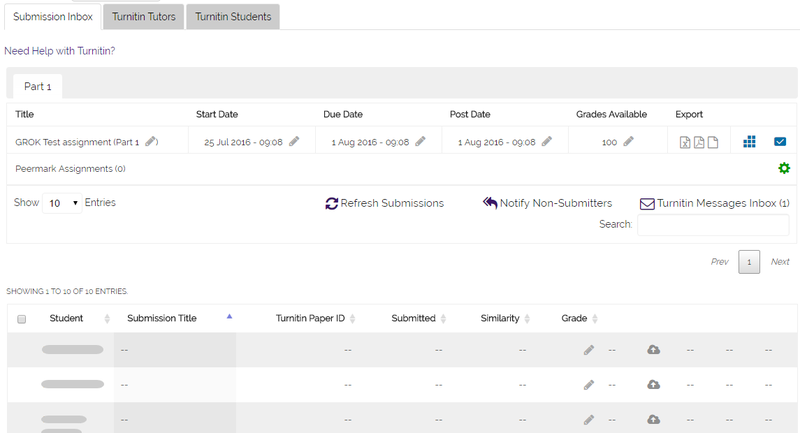 PLEASE NOTE: If you sync the Moodle gradebook from the Turnitin assignment, you must click the Refresh Submissions button to re-sync the submission. For detailed descriptions of every assignment option, please refer to the GROK article Turnitin: Settings In Detail.